Here are 150 very clever and easy DIY storage ideas for a neat home in every room, because we’re all for saving some money, especially when it gets our creative juices flowing. Storage is always one of the nagging problems at home that is not always so easy to solve. There are always things lying around the house, especially if you don’t live alone, and more so if you have kids. You could buy shelving, racks, boxes, baskets and other storage systems but that can add up to spending quite a lot. But sometimes it takes just a little more creativity to keep the clutter away from your home with DIY storage ideas. We do understand that time is precious and you may not necessarily want to read a lengthy article about DIY storage ideas. So if you just need a quick solution to your storage problems but you also want to do it in a stylish way that doesn’t hurt your home decor, here are 12 of our favorite easy ideas for a quick fix that you can use and skip the rest. However, if you want to spend more time finding the best DIY solution, read this article fully. If you haven’t invested in a bed with a storage unit beforehand, it might be too committing to change the bed for you. 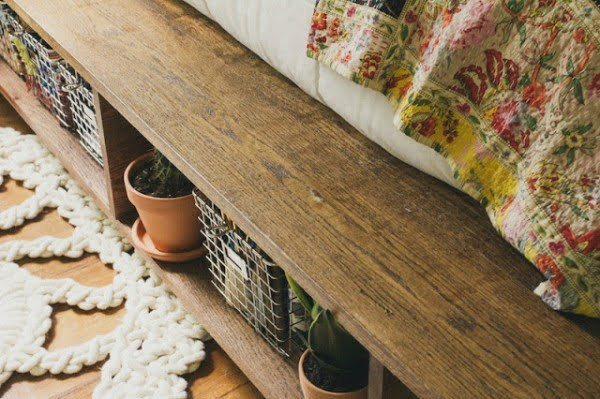 That’s not a problem with this tutorial showing you how to use simple wood crates to add under the bed storage. Beautiful baskets are essential to home storage. You can put them on open shelves (read also about our picks for the best bookshelves for small spaces), under console tables, in corners to create drop zones, and they won’t disturb the decor with their attractive design. But unsurprisingly, they can get pretty pricey if bought in stores, especially when you need several of them. This tutorial shows you how you can make some yourself at the fraction of cost. Create these little useful storage bins to create a wall organizer that you can hang anywhere for storage of small things. They’re cute and have decor value too. If you have some spare PVC pipe from a recent renovation (or you can buy some), you’ll appreciate this idea for a DIY shoe rack. Not only it provides a convenient organization for shoes, but it also makes an interesting decor feature too. Cooking utensils can make quite a mess in the kitchen cabinet drawers and you may not have enough rack space available to hang them neatly. 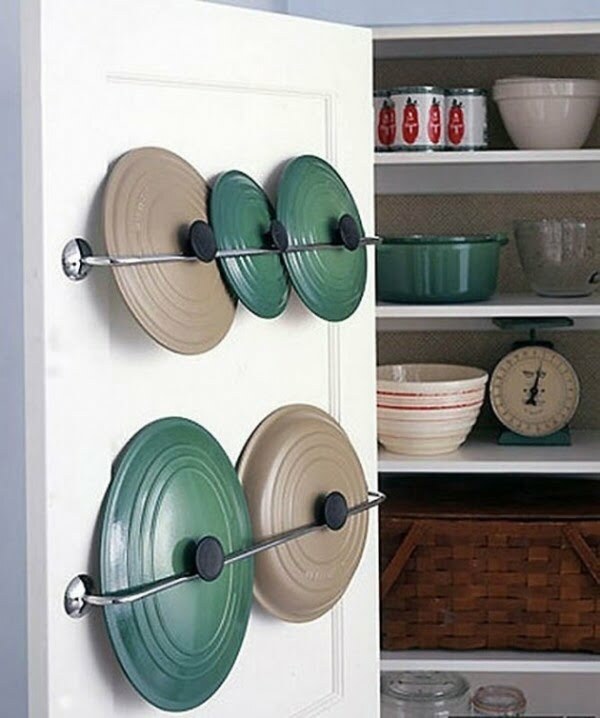 Use this idea for a rotating utensil rack that you can install under suspended cabinets. 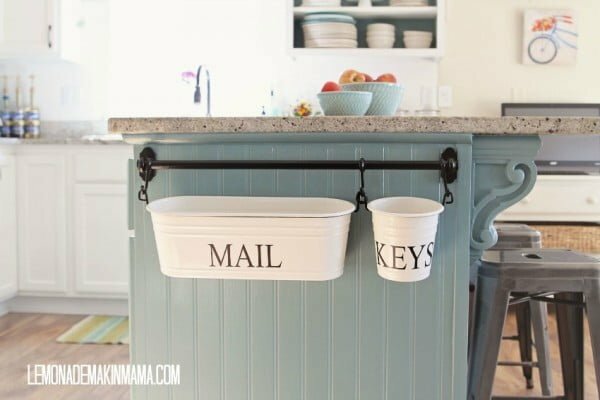 This unbelievably cute storage basket idea is proof of great things you can do with a little creativity from old materials that are just lying around. Follow the tutorial to upcycle a simple cardboard box and an old sweater. Wall corners (especially by the doors) are rarely used effectively and stay empty. Add these little wood plank corner shelves for extra storage and display. Space above doors is rarely used because it’s not easy to make it work with the decor. The solution is using crown molding which adds architectural interest and makes a great decor feature while giving you some extra space for storage or display. Shelves are great to store things but did you know you still may be leaving a lot of unused space under the shelves? If you screw the lids of jars to the surface, you can suspend these jars for extra storage of small things. This space is usually left empty but you can easily add hooks or little shelves for extra storage of small items in the kitchen. 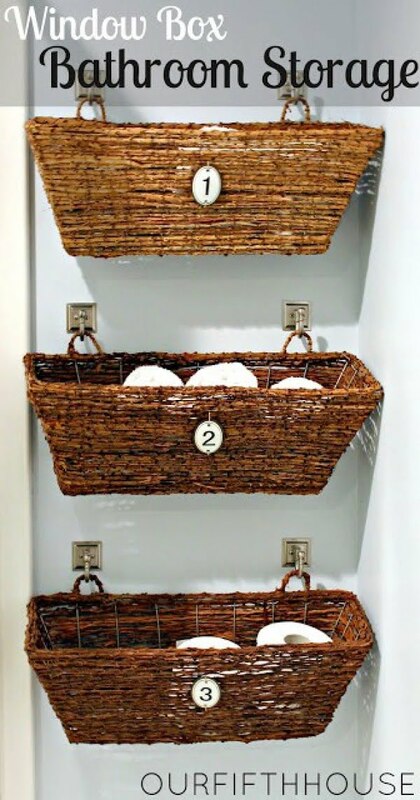 Simply hang baskets on hooks in the closet for extra storage with easy access for small things. Under-bed storage is an exceptional solution for individuals who need additional storage space in their bedroom and may not have the option to use cupboards and wardrobes. 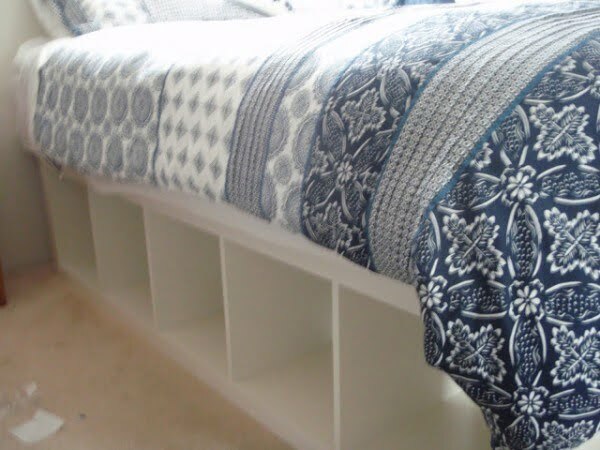 DIY bed storage is especially popular in children’s bedrooms and smaller spaces because it is simple and effective. 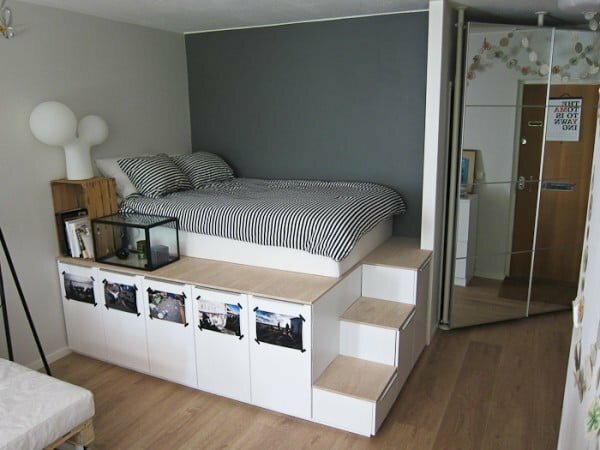 This type of storage is most suitable for standard-height and platform bed frames as the height provides the space for storage. Designed to optimize the use of space, these solutions can also create a more stylish look. Below are some DIY storage ideas that can be used in your bedroom. These beds will help you to maximize storage space, creating good-looking furniture pieces with multiple functions. The footboard is designed to creatively hide the storage space in the middle. The headboard also serves as storage space, which makes these beds super stylish and practical. Under-the-bed-drawers provide a great way to increase storage space without using up additional floor space. They are especially handy when lack of space is an issue. In fact, they can be used to replace dressers and other big storage units when space is tight. This platform bed provides additional storage space. It is also remarkable for a small room in which a typical full-size bed wouldn’t necessarily work. One of its great features is that the bed can be customized to fit the size of any space. It also adds more style and function than a futon. Storage space is valuable in every home and when it is both useful and adorable that just makes it even better. These DIY bed storage drawers provide a great place to store lots of shoes and prevent them from dust exposure. These drawers can also be a solution for many other storage needs. 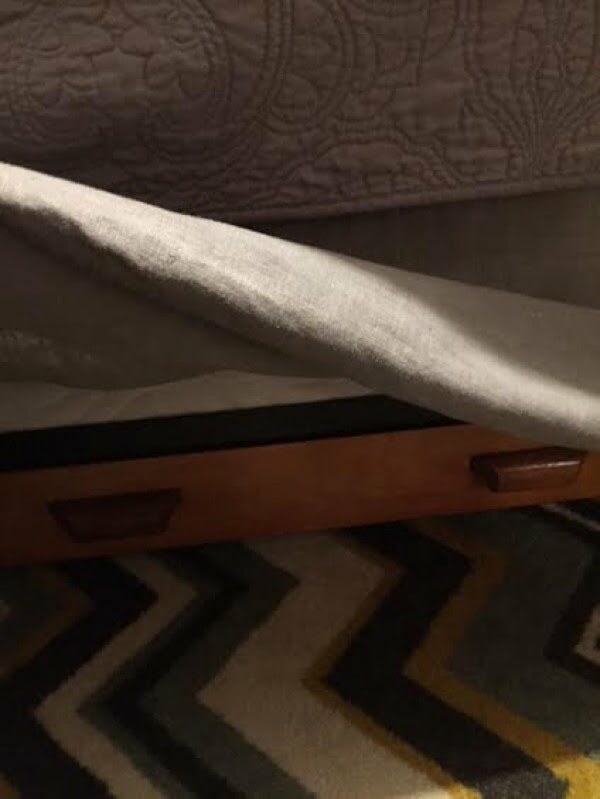 This large under-the-bed storage drawer is equipped with 4 small wheels to ensure you can easily slide it in and out to gain access to the contents. For a small cost, this storage drawer can provide huge storage space for shoes or any other items that require storing. This queen-sized storage bed allows you to adapt your plans to create the space you truly want or need. Each side has a remarkable amount of storage space and the design maximizes the room so items of different sizes can be stored. Shoes, baskets and other items are ideal for this DIY bed storage. This Japanese-style storage bed is built on a platform and creatively uses much of the available space as storage. From the attached side tables to the footboard with its shelves and cupboards, this piece is sure to solve a number of your storage issues. This storage solution combines 4 drawers that have been re-purposed into a ‘single’ under-the-bed storage unit. After gluing and nailing the drawers together, they were placed on plywood to boost the strength and durability of the unit. The final project makes for a nifty storage space with multiple partitions for easy, convenient storage. This customizable unit can be made to fit any size mattress and it provides plenty of additional space to satisfy your storage needs. The sides of the bed can be used as storage for shoes, books, baskets, blankets and many other household or personal items. This solution has lots of storage space and with its clean lines, style and function will be injected into space. Once you have the basic knowledge, its versatile design and build-to-shape formula can be duplicated to fit any size mattress. This unit is designed to help with maximizing storage and organization. It is suitable for rooms of different sizes but is especially remarkable in a room with the limited amount of space. With the base built with kitchen cabinets, with doors to conceal their contents, this unit will provide an abundance of storage space. These storage drawers are made with flush paneled sides and have eliminated the use of drawer pull hardware for a sleeker look. Adding the drawers under the bed has created an incredible amount of storage space. With two drawers on each side and two at the foot, this unit is sure to meet many of your storage needs. The storage space provided in this under-the-bed storage unit can be used for plants, shoes, books, and baskets of various other odds and ends. If you have limited closet space or storage is otherwise scarce, this unit will help you to organize your bedroom and keep it neat and less cluttered. This project allows you to build a portable bed frame. You can improvise to get the job done by building two bookshelves and place a slatted base in the middle. Follow the tutorial for complete instructions. Most of us have small bathrooms where there’s little space to place big furniture or make any major decor improvements. But we still want to have a cozy and attractive area and not a place to hide from your guests. More than that, it’s important to keep your bathroom accessories stored neatly without cluttering the limited space. Small but clever bathroom storage solutions come to the rescue as they can help you organize the space and make it look prettier. And what better way to add lots of decor value than to build something yourself, usually in our beloved rustic style. That’s why we’ve picked some of our favorite DIY small bathroom solutions for you to try at home. We invite you to try the ones you like and share your results with us. The space over the toilet is usually left empty and it’s difficult to decorate it or use it for storage. However, if you use some creativity, you can easily build a leaning shelf that will serve to store your toiletries, towels and other accessories. The plans form Ana White will help you build it easily. You’ll love the rustic style too. While this DIY bookshelf is built from wood crates and can be used in any room, a small bathroom is a great home for it. First of all, it looks like a nice handmade piece of furniture that will add value to your decor. And secondly, it will give you a lot of space for storage in a small area. Check out the easy tutorial which involves just painting the crates and fixing them together. This is one of the most clever solutions for small spaces ever. You will always find an empty corner to use for it and it will always make the room look better. Softening the corners is one of the easiest ways to increase space perception and your small bathroom is the perfect place to try it. Check out the tutorial for instructions. Hanging small cabinets on the wall in the bathroom is common and it’s a great storage solution. But instead of buying one, why not build something spectacular yourself. This antique vintage look is achieved by repurposing an old window and you can easily get it for your own small bathroom. Check out how it’s done in the tutorial. 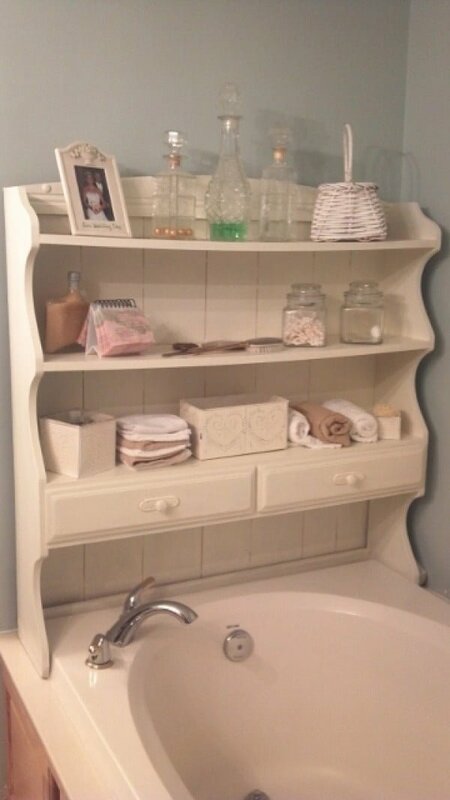 Get some extra storage space and decor style for your bathroom by building this caddy from reclaimed materials. The rustic look is lovely and you can easily hang it on the wall above the toilet. Check out how it was done in the tutorial on Hometalk. For all the small items in the bathroom, you need some type of storage containers. Make them add decor value by repurposing old jars with vintage door knobs. The looks are vintage rustic and it’s totally charming. The tutorial will show you exactly how to do it. 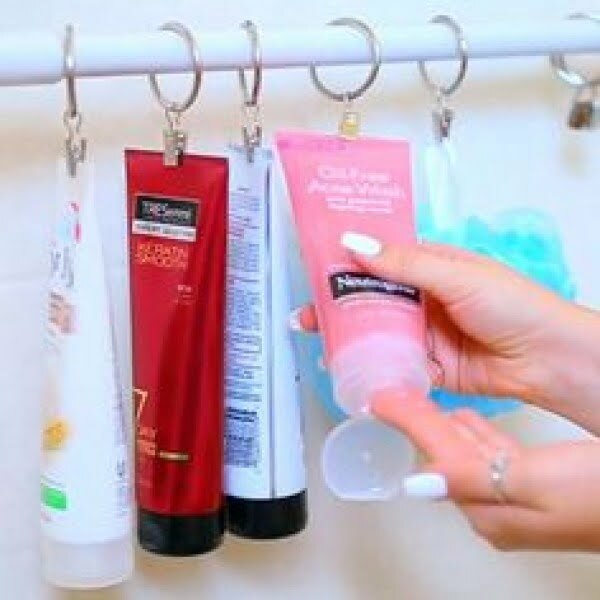 If you need more ideas on how to organize all the small things in your bathroom, here’s another one. Using a simple pot is not an attractive way, by no means. But turning it into a rustic basket is a legitimate decor trick that you can use. Find more information on how it’s done in the tutorial. Hanging baskets on the wall for storage is nothing new, so why not use window boxes for this. Wicker boxes work just great for a rustic accent and you can get the rest done easily too. Check out the full story of how to make it happen. Get this look of a small rustic towel rail that will fit even the smallest bathroom. The rustic accent adds a lot of charm to bathroom decor and it’s extremely useful to keep your towels. The DIY project is easy if you follow the tutorial. It’s the little things that add character to your decor. So making something as simple as a tissue box cover from wood can be that decor detail that changes everything. Try adding it to your small bathroom along with other rustic accents to see the difference. Do you find trouble with organizing your makeup and accessories? Have them neatly stored without occupying much precious space by building this awesome magnet board. Not only it’s very useful, it looks great too and it’s the perfect decor accent for a small bathroom. Check out the tutorial for more information. This storage solution may not add decor value (since it’s hidden) but it can prove to be invaluable in small spaces. Add it to your bathroom cabinet doors where possible for lots of extra room for storage. Check out the plans and the tutorial on how to build it. This may be a very simple solution but it’s super cute. 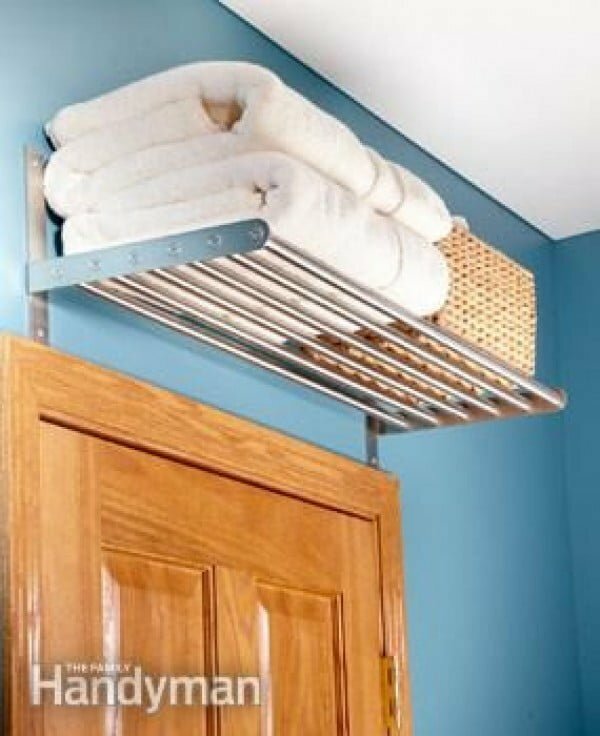 You can make more use of your towel rails if you hang attractive baskets on them. This way you get more space for storage and way more decor value. Check out the tutorial which includes installing towel bars as well. If you’re the one for spending an extra minute in the bathroom, this wall mounted magazine rack may seem like a good idea. Although, in our opinion, since you’re more likely to spend your time browsing your phone, this rack has more decor value than it is useful. There’s more than one way to hang baskets on the wall for storage and this is one of the more original ones. Baskets hung this way may store less but they certainly have more decor value. Making these shelves is easy but check out the tutorial for detailed instructions. Storing items in a box isn’t much of an idea on its own unless you use some creativity to add decor interest into it. This brilliant rustic design of a simple storage basket was created by simply wrapping some rope or twine around a simple carton box. Check out the tutorial to try this awesome idea at home. Everyone loves to have a clean and uncluttered kitchen. But keeping all the clutter under control is not an easy task because kitchens are known to be filled with a lot of items and foodstuff. Here is a selection of perfect DIY storage ideas for the kitchen that can enhance efficiency. Floor-to-ceiling plate rack- This is one the favorite as it does the trick perfectly while at the same time adding a touch of class and pattern to a kitchen. You can create racks where you can keep platters and pretty dishes, ensuring that they are accessible. Small countertops- Most designers always incorporate this idea in kitchens they design, and for a good reason. Countertop storage can be used to keep a lot of items because of their accessibility. Pullout pantry- This idea makes perfect use of kitchens that have narrow space. They can be designed with a tiled front for a better look, so that when you close they appear like they are part of the wall. Open shelves- Having open shelves built on either side of the range can save a lot of space. Better still, having all the dishes in view makes it very easy for visitors to help out with the preparation of food and access the dishes to serve themselves. Mable slabs- These storage options make for dramatic but useful open shelves. You can choose to have a row of file drawers, where you keep small items, spices, and recipe cards. Plate racks-small plate racks are practical and charming at the same time. You can have them designed with dowel dividers to prevent chipping. They simplify chores like emptying the dishwasher. There are many DIY storage ideas that you can consider today and de-clutter your kitchen. These tips are not only useful to you; they also add a beautiful touch to your kitchen. If you’re a crafty person and like to take up an occasional DIY project, you’ve probably already tried a trick or two to improve your kitchen. If you haven’t, this is your chance to get started. Here are 15 brilliant DIY kitchen organization ideas that will help you organize your kitchen and make it look pretty at the same time. 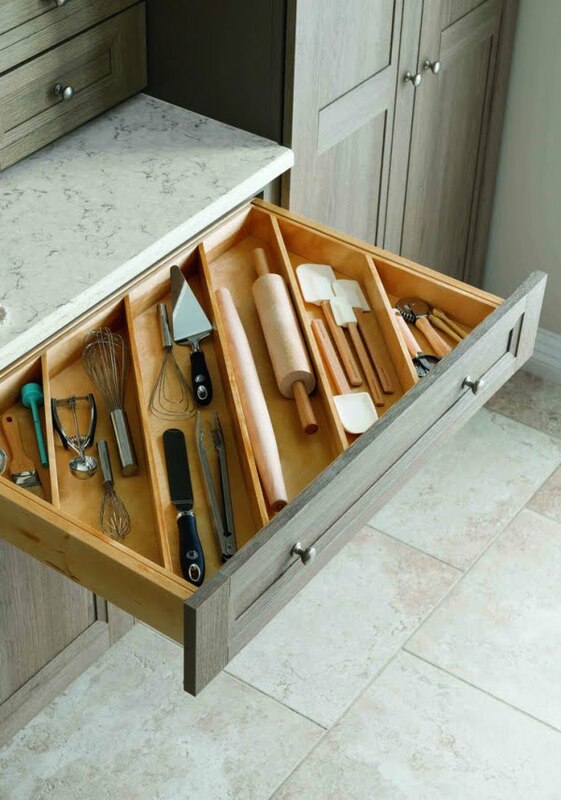 Build and add an organizer drawer to a kitchen cabinet for baking sheets, trays and other thin utensils. It’s easily accessible and enables you to put all your sheets away neatly in one place. 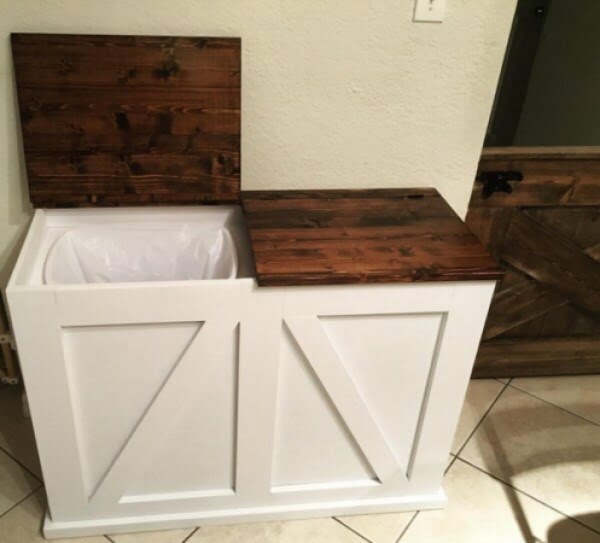 Trash bins in the kitchen are best hidden out of sight and this little project allows you to have two bins for waste sorting and recycling. It makes a pretty unit which can be used as a bench and an attractive decor feature. You can store your plates in a cabinet stacked in a pile, or better yet build this rack to store them horizontally in an easily accessible way. It also helps the plates dry out quicker and better after washing them. As a built-in storage solution, it doesn’t take up extra space either. There are many ways to organize small things in the kitchen but this DIY project is particularly cute and very simple to make. All you need is a can and a piece of burlap fabric to cover it. You get a cute rustic organizer. IKEA products can be used in ways they weren’t originally intended for, which makes great inexpensive hacks for your home. This utensil rack is made from Sultan Lade bed base. Brilliant. A Murphy bar is a great functional piece of furniture for small spaces and you can build one for your small kitchen too. The brilliant design of a cabinet that folds down to a bar will give you more than just storage space. This small but efficient produce stand will take just a corner of free space but it will give you the ability to not only store fresh produce but put it on display in your kitchen too. You can use the space between the fridge and the wall to install this pull-out hidden storage cabinet. It uses dead space and gives you ample space to store jars, cans and other small items. This particular DIY charging station idea uses Ikea Fintorp kitchen organizer series but you can use any type of basket to hang it near a power outlet to create a space to charge your gadgets. Make it look chic. This DIY serving tray is easy to make and it’s a very chic way to add some style to entertaining your guests or just add another decor piece to your kitchen. If you don’t like cutting wood, here’s an easier project with as good a result as the previous one. All you need is an old cutting board and a pair of handles, you can apply wood finish for a complete look farmhouse. If you can find a vintage cheese grater, you can repurpose it into this awesome rustic style kitchen organizer. You know how messy utensil drawers can get, and finding something that you need in a disorganized pile can be quite impossible. Here’s how to organize it the DIY way. A pegboard actually makes a great kitchen organizer and all you need is some empty wall space (which is usually plenty of in most kitchens) to put those pots, pans, and utensils on display. It’s unexpected but makes a brilliant decor feature. Turn the Ikea Moppe mini chest into a chic style tea chest which will make an adorable decor item in your kitchen. The coloring of the drawers in this example matches the types of tea that each of them stores. A simple yet brilliant idea to create a spice organizer in any drawer. Build it and arrange your spice jars in a very accessible way. Storage in small spaces is always tricky. That’s why you have to be extra creative when it comes to your DIY storage ideas. Here are 15 projects that implement storage in a functional way in multipurpose pieces of furniture that are perfect for any room that lacks space. As a bonus, most of these ideas have lovely rustic or farmhouse look that will add a lot of value to your home decor. This is a really great DIY project that is easy to follow and results in multiple pieces of furniture with multiple purpose. You get an awesome farmhouse style coffee table with plenty of storage room, and stools which can be also used for extra storage. And all you need are a few wooden crates and wood boards to build it. The best thing about this DIY project is that it’s so easy but you get a very attractive bookcase as a result. Take a few crates and fix them together, paint them in a color of your liking and that’s all it takes to build a wonderful piece of furniture for your home. 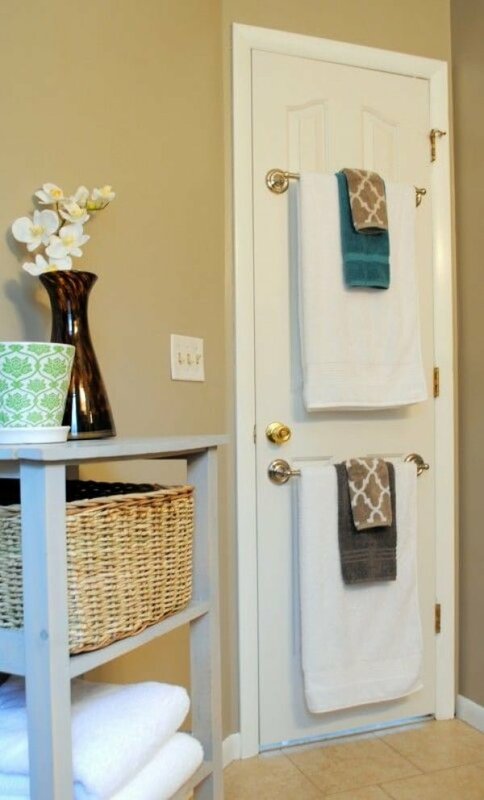 It’s great for displays in your living room or towel storage in the bathroom. Building a sectional sofa may sound like a big task but it’s a lot easier than you think. Check out these plans and the story how it was done. Whether you’re up for the challenge is for you to decide. If you’re looking for a new bed for a guest room or your master bedroom consider building your own as an option. This platform bed is quite easy to put together and it provides ample of storage space. Have you ever noticed that if you turn a simple vertical bookshelf on a side it looks very much like a bench? Use this hack to your advantage to build a simple yet attractive storage bench. You can pick up cheap bookshelves from Ikea for this little project. 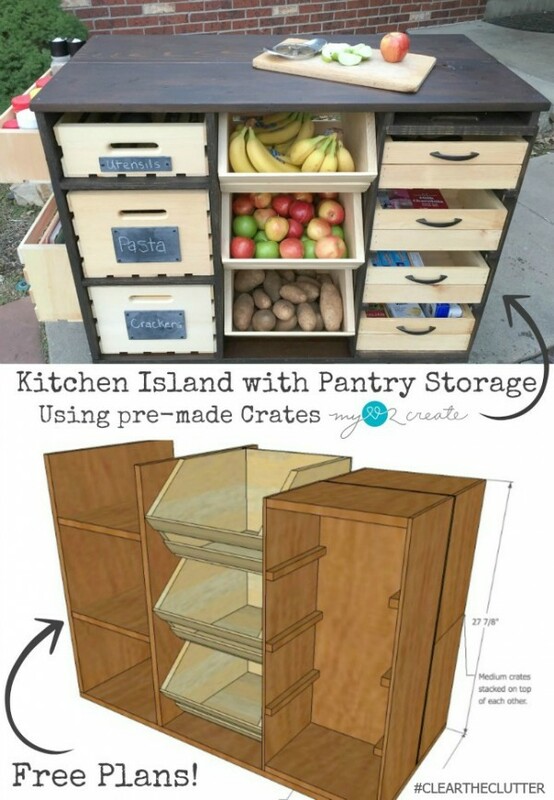 Another great DIY project that makes use of wooden crates from storage. Instead of stacking crates with stuff you can build this attractive bench with plenty of easy storage. Originally it was built for shoe storage but you can store just about anything in this convenient piece of furniture. A window seat is a great functional piece of furniture but the problem is it almost always has to be custom made to fit your room. Well, this problem is easily solved and you can have fun while doing it. Build your own window seat bench with storage by following this easy tutorial. Whether you build a coffee table or an ottoman following these plans is entirely up to you. This DIY project is very easy and requires only two crates to accomplish. Get your own unique rustic accent piece for your home. A small bathroom can certainly benefit from extra storage but you have to work in a very limited space. Consider building this small but spacious storage shelf in rustic style. Your bathroom decor will never be the same again. Building a DIY kitchen island with storage may not be the easiest DIY project but this one is as easy as they get. This piece of furniture will easily become the focal point of your kitchen decor and it’s very functional too. It makes use of wooden crates for storage really well and does it in a very attractive farmhouse style. If you like farmhouse style accents in your home decor then you’ll love this little DIY project. 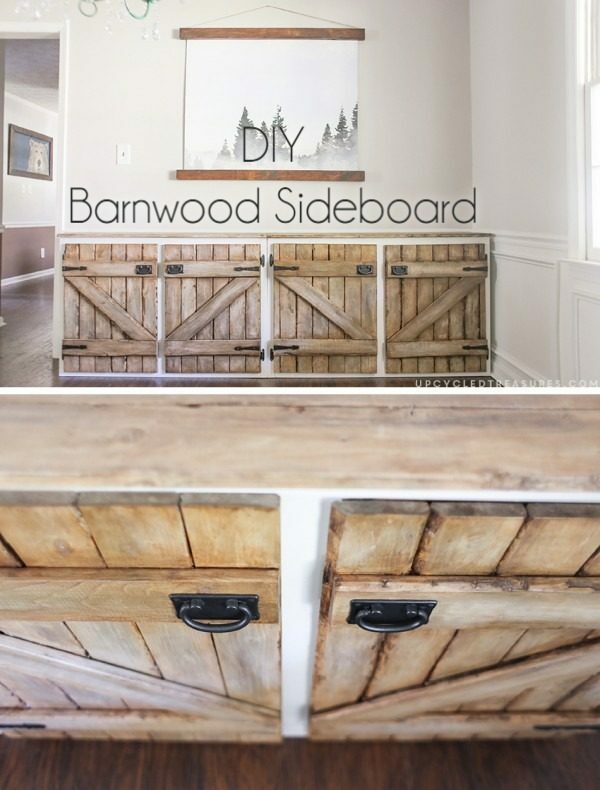 Transform just about any old cabinet with these rustic barn wood doors that create so much decor interest. 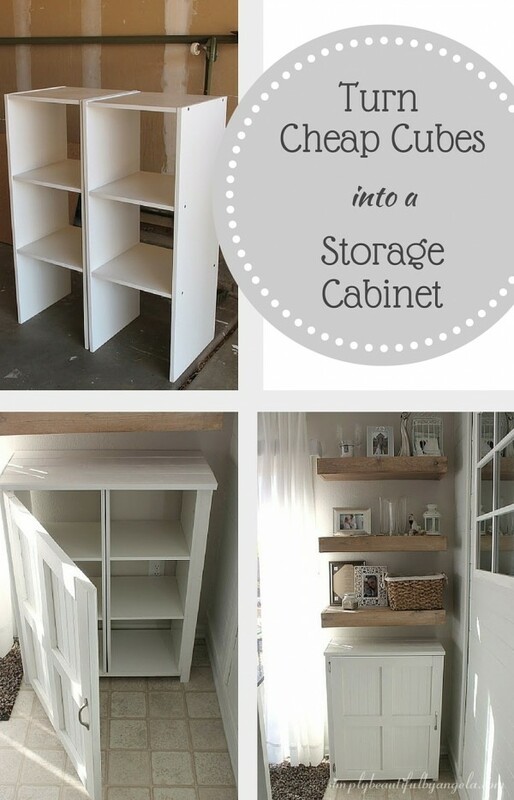 Cheap storage cubes can be made so much more attractive by building a cabinet from them. This DIY project is easy to follow and you’ll absolutely have fun while building your own storage cabinets. Another great DIY project that makes use of wooden crates. We don’t have to say how easy it is to fix the crates together for a nice storage unit. This project adds lovely drawers for some closed storage and the wood stain goes so well for a rustic style. If your laundry tends to get disorganized try building a storage unit to organize your laundry room on the fly. It’s an easy DIY project but a very useful one. This lovely DIY piece of furniture has a very functional design. Wooden crates provide a lot of storage and the drawer frame makes it very accessible. You can use this unit as garage storage or apply wood stain and use it as a rustic/farmhouse accent piece in the kitchen to store produce. If you can get your hands on an old but attractive crate, you can have an easy DIY storage box for just about anything. In this tutorial, you will learn how to build a mobile toy storage box by adding rope handles and wheels to a vintage crate. Can’t get any more rustic than that and we love it. Are you up for a unique decor feature? Try these birch wall hooks that look a lot more interesting than a regular coat rack. We love the minimalist and rustic style that this idea introduces. Your kitchen needs this awesome coffee mug rack that you can make from pallet wood. The idea is so simple but quite genius – it had spread like wildfire on Pinterest a while ago. Build this rolling bookshelf (which is quite an easy project if you follow the tutorial) and save on a storage unit furniture while adding an attractive decor feature to your living room. It’s perfect for storage and display vignettes. While this project is a bit more involved than others on this list, it can be just what you need if you’re looking for a storage system with more space. This rustic apothecary cabinet is visually appealing and obviously practical. Try the tutorial if you’re up for the challenge. When it comes to unique ideas, this end table is certainly one of a kind. Take an old clock face and turn it into a whimsical end table for your sofa (read also about our picks for the best sleeper sofas). Extra decor points guaranteed. Rustic or modern industrial – likely something in between – these adorable little shelves will sprinkle your kitchen decor with whimsy. And this project is quite simple to do too. If you need to organize your knives in the kitchen, here’s a rustic idea for you. 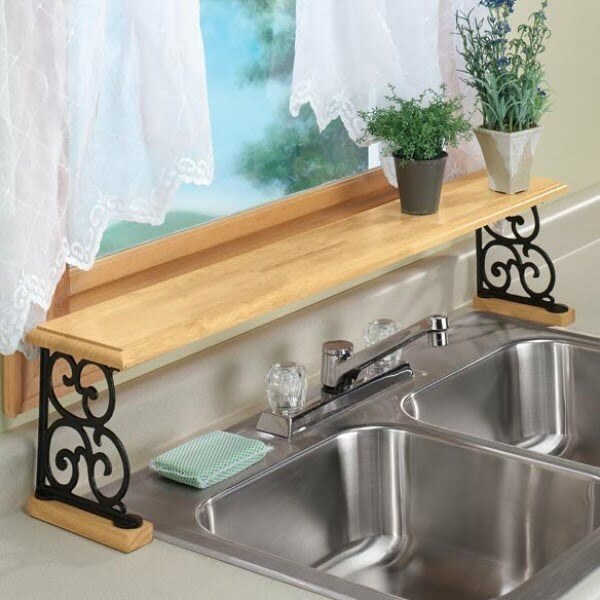 This little project involves just installing little magnets into a simple wood plank, but the end result is the perfect rustic kitchen decor feature. Those bulky vintage suitcases make perfect makeshift furniture, so if you can get your hands on one, you can make this wonderful whimsical coffee table that will certainly improve your decor. Repurposing old materials is a big part of rustic DIY crafts and this lovely coffee table made using an old window frame is a wonderful example. 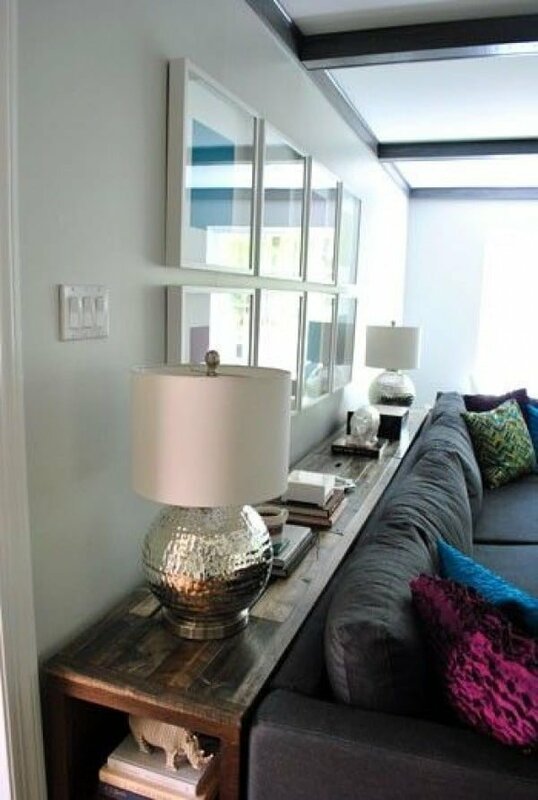 Make one for your home and you’ll have an attractive coffee table with storage space that works as a display case too. 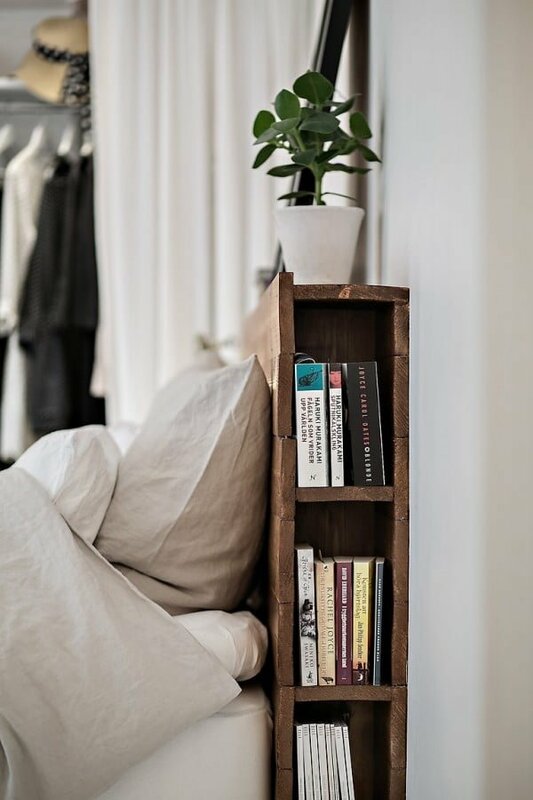 Sometimes a simple bookshelf is all you need, but why not make it rustic and why not do it yourself. Here’s how you can quite easily do that. 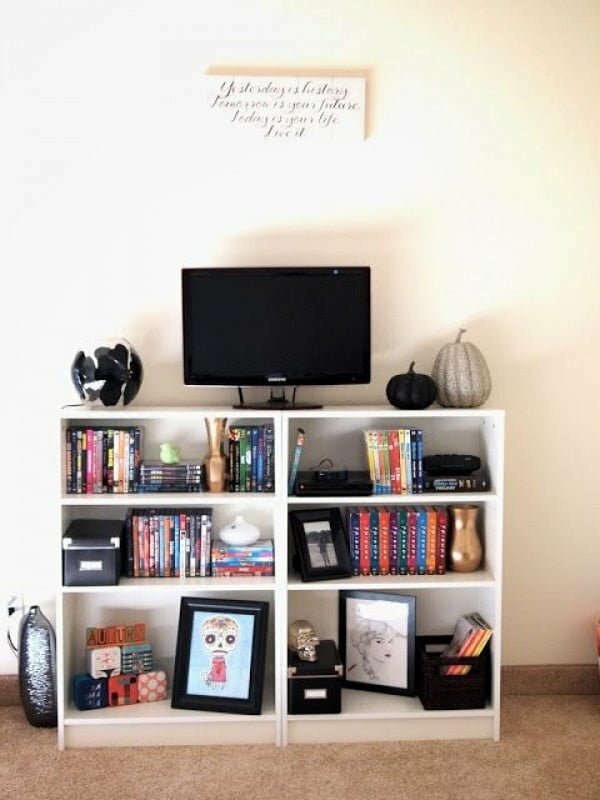 The benefit of building a bookshelf out of crates is two fold – first, you have a cheap but attractive piece of furniture, and secondly, you are free to choose any shelving layout you want. One of the best solutions to organize small things around the house is a tray that you can place on any surface in any room. 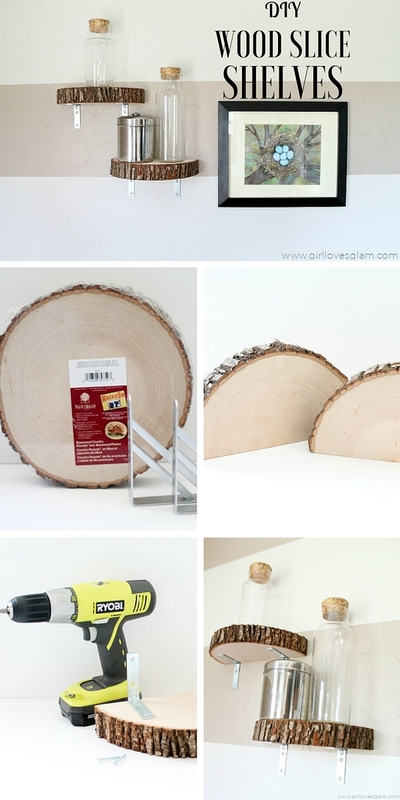 A rustic wood tray that you can make yourself brings this idea to a whole new level. 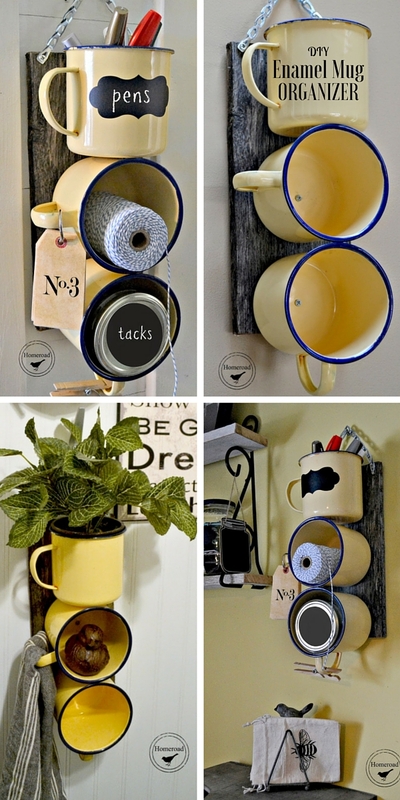 Such a wonderful idea to use big enamel mugs and build little wall shelves for small things. It brings a lovely rustic country style to your decor. We’ve had these lovely mason jar shelves as a DIY project before but it’s worth bringing them back – they’re just that lovely and brilliant. Even if you have plenty of room for storage, you don’t really want random things to be in the view spoiling your well thought out interior design. That’s why any clever or hidden storage and organization idea that hides your stuff effectively is the best idea in the world. We love them too so we’ve come up with quite a list of 55 amazingly clever ideas that you absolutely must try at home. 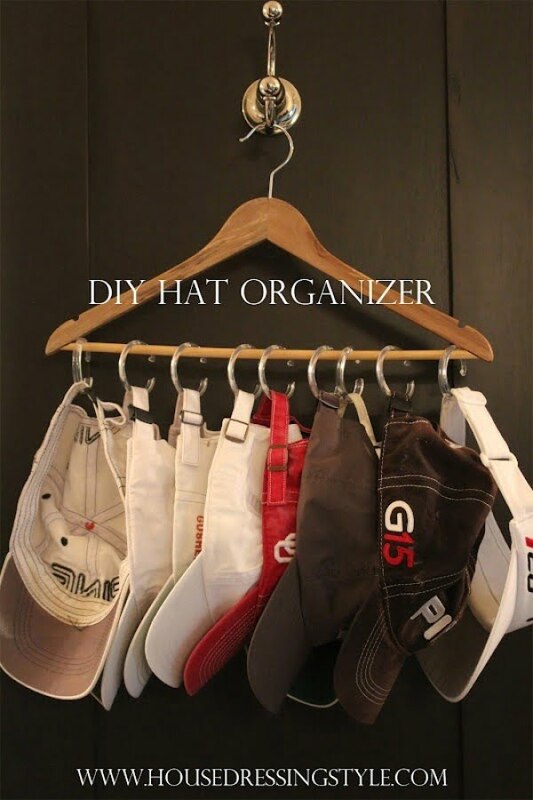 Use a simple coat hanger with an array of curtain hooks to hang your hats for easy and convenient access without cluttering up. The same idea can be used to store much more than hats. Limited space means getting creative and you can use your kitchen cabinets a lot more effectively too. Build under the cabinet drawers to store knives and other utensils. Cables can get messy but not if you organize them well. Toilet paper tubes work surprisingly well for this. Cutting boards are compact so storing them is not much of a problem. Especially when you use free cabinet door space so effectively. 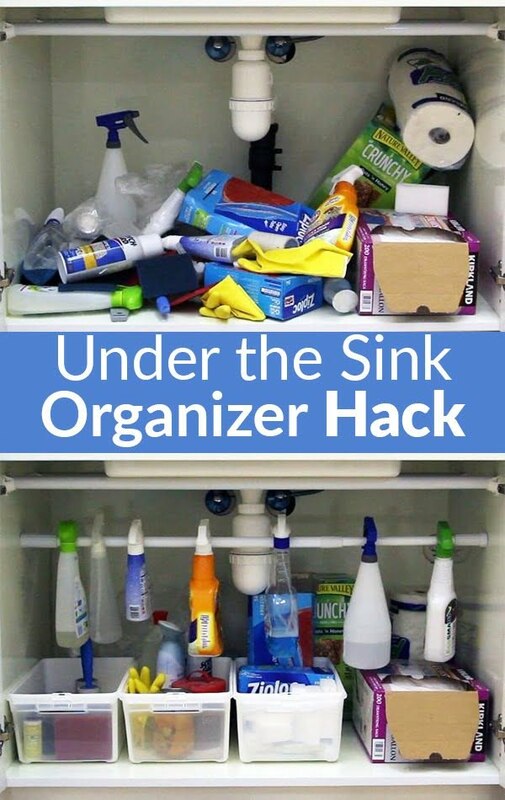 The space under the sink is convenient to store various cleaning tools and items. But it tends to get cluttered up. 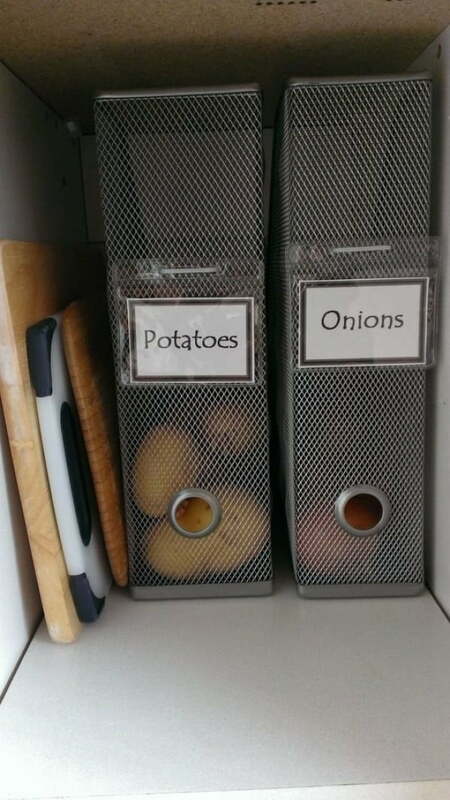 Use this organization idea to keep it tidy at all times. Corners are usually empty in any space. If you like to use your space effectively, install corner shelves that can be used for storage and display. Using spice racks in the bathroom can give you a lot of space to organize your shampoo bottles and other small things. Wine rack in the bathroom? 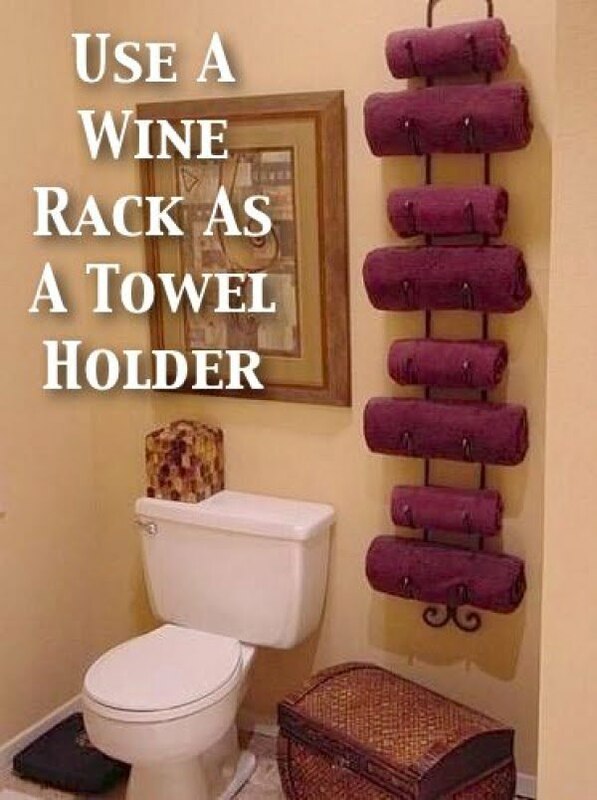 That’s a brilliant idea so long as you’ll be storing towels and not actually bottles of wine. 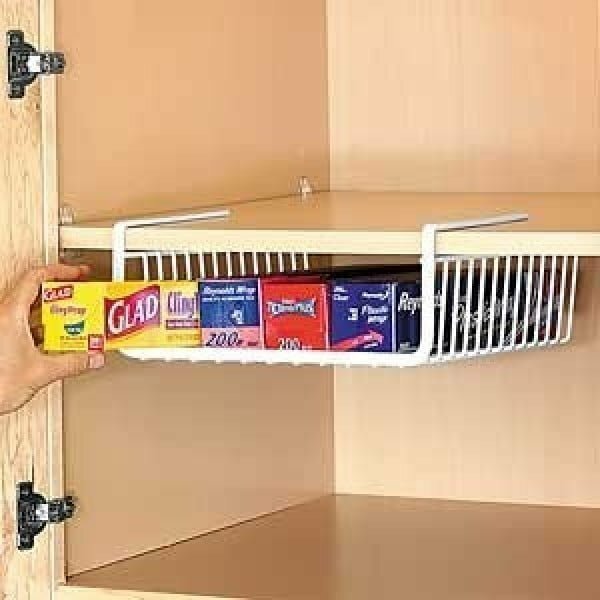 Cabinet space can be used a lot more effectively if you use these useful holders for small items under the shelves. 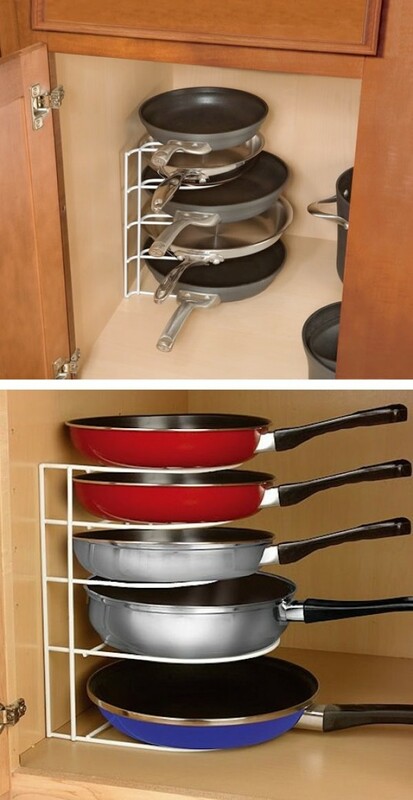 For pans to take up less space, use a corner rack like this that will organize them for very easy and convenient access. Having lots of small metallic items in the bathroom can get messy. 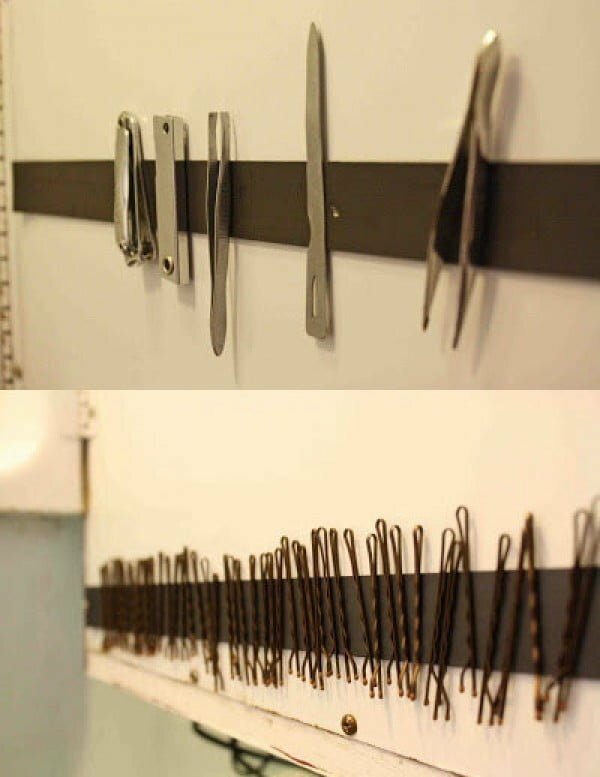 Here’s an idea to use a magnetic strip to store everything in order. Hidden storage units are very useful, especially in small spaces. Here you can see a pull out pantry that uses dead space next to a fridge effectively. If your bathroom is so small you can’t find enough space for a towel rack, you can use the space that’s available cleverly. 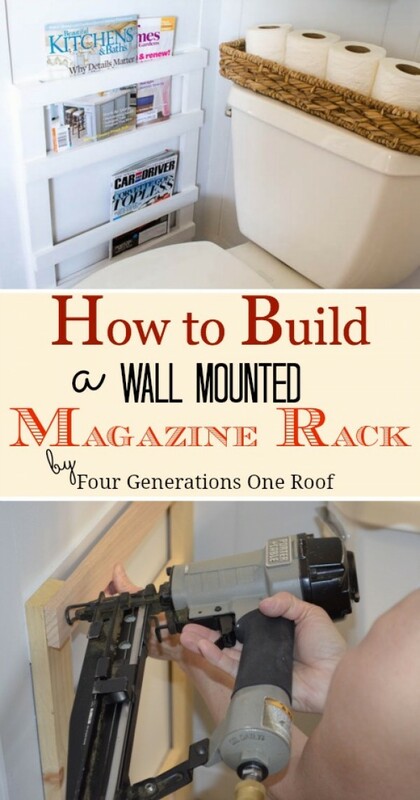 Use the door to mount the racks. If you mount coat hooks low near the floor, it makes the perfect shoe storage rack. Place in your entryway. A good old pallet makes a great storage unit for various tools in your garage. 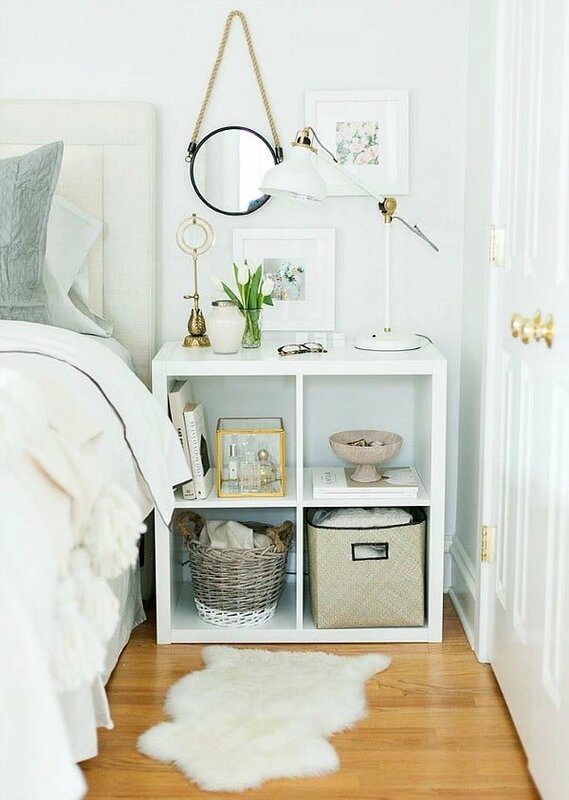 Having more storage in your bedroom is becoming more commonplace and so is using a small bookcase for a nightstand. There’s a lot of space to be used for storage under the cabinets and you build drawers to make use of it. Use the space under the bed effectively by making use of pull out drawers on wheels. Organize your shower items better with a curtain rod and hooks. It makes for an easy access and eliminated clutter. To keep your kitchen cabinets clean and tidy, avoid bags to store vegetables and use magazine holders instead. The labels even help you keep it organized. There’s a lot more space to be used for storage than you think. 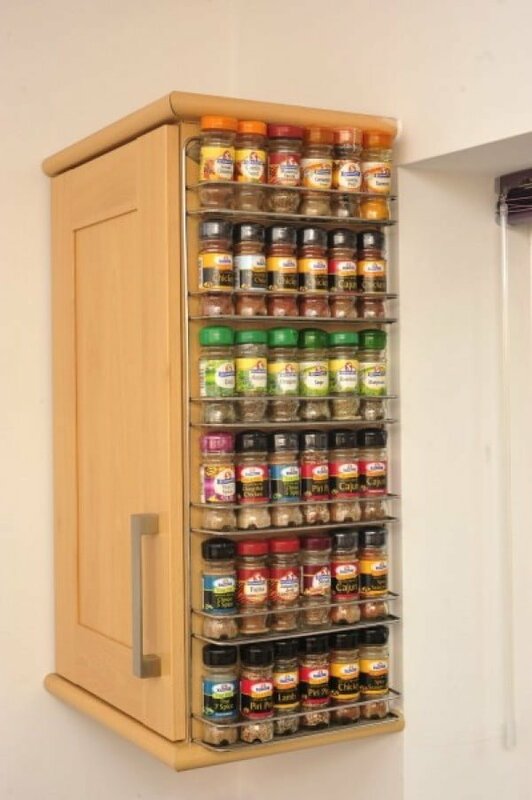 This idea to use the side of a cabinet for a spice rack is the perfect example. If you like classy and chic ideas, how about this bucket system to store important small items? It is visually attractive while keeping things readily available. 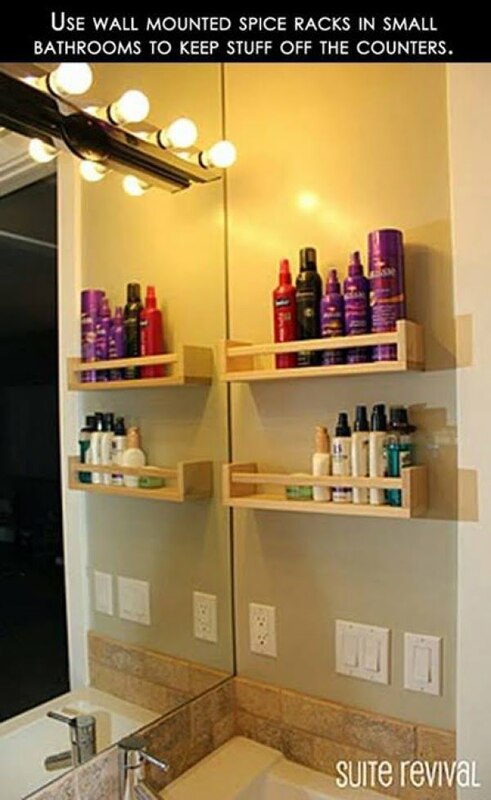 If you own a lot of cosmetics, why not make a display of it with decorative shelves. This over the sink shelf is a real beauty, introducing some extra storage space in the kitchen in an attractive way as a decor accent. 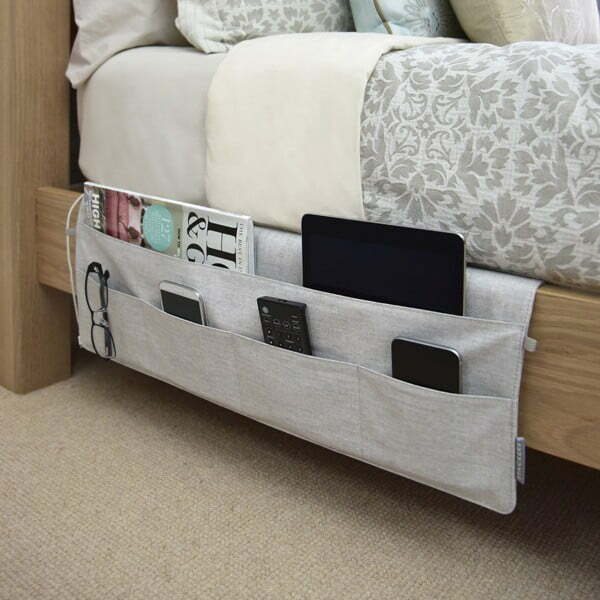 Bed pockets are very easy to add and give you some extra space for magazines, books, electronics, and other small items without the need for a nightstand. Using wall-mounted baskets like this makes attractive rustic shelving and adds a lot of decor interest in limited space. 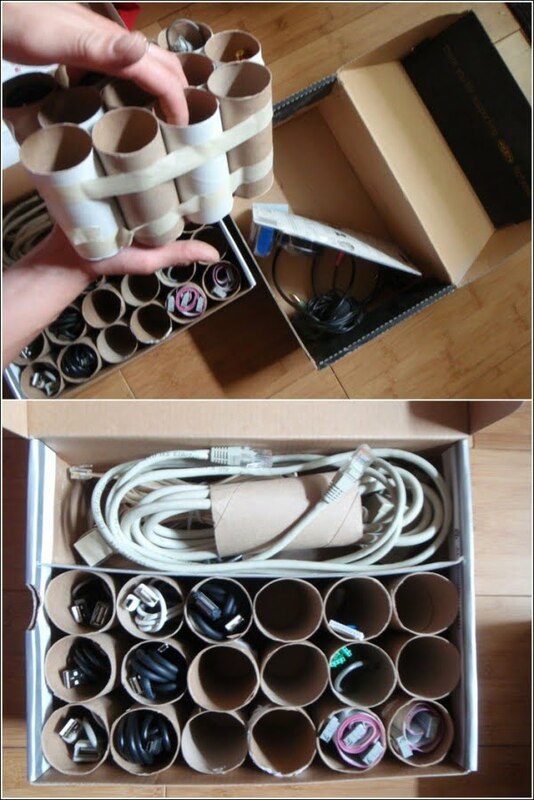 Using PVC pipes as a shoe storage organizer must be the ultimate solution to sort out your shoes. Clothes storage drawers ten to get messy with small items. Organize your drawers with organizers to keep them tidy. Kitchen utensil drawers tend to get messy with all the small tools you store in them. Use an organizer to keep the utensils separated and tidy. Here’s another idea to keep your lids handy taking up as little space as possible. Use rods attached to the inside of cabinet doors. Your headboard can do much more than serve as a head rest and decor feature. Small shelves can be implemented to store books and other small items. 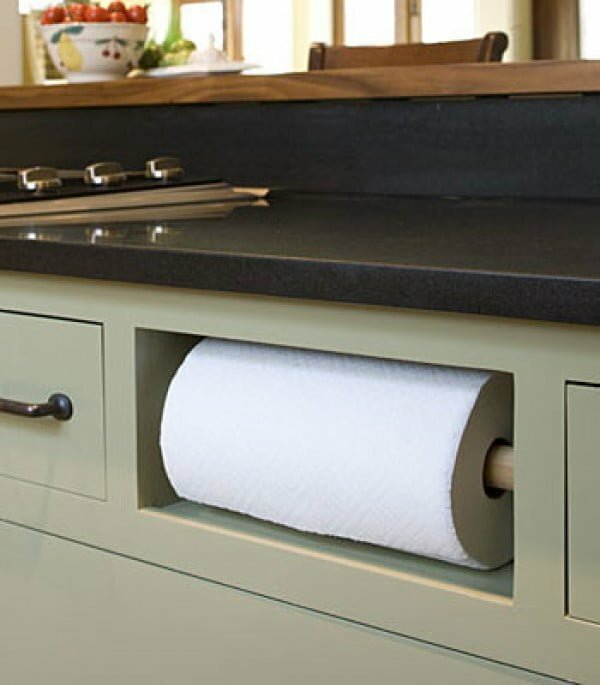 Use a single drawer space to keep a roll of paper towel ready at all times in your kitchen. It doesn’t distract visually and it’s a nice functional implementation. 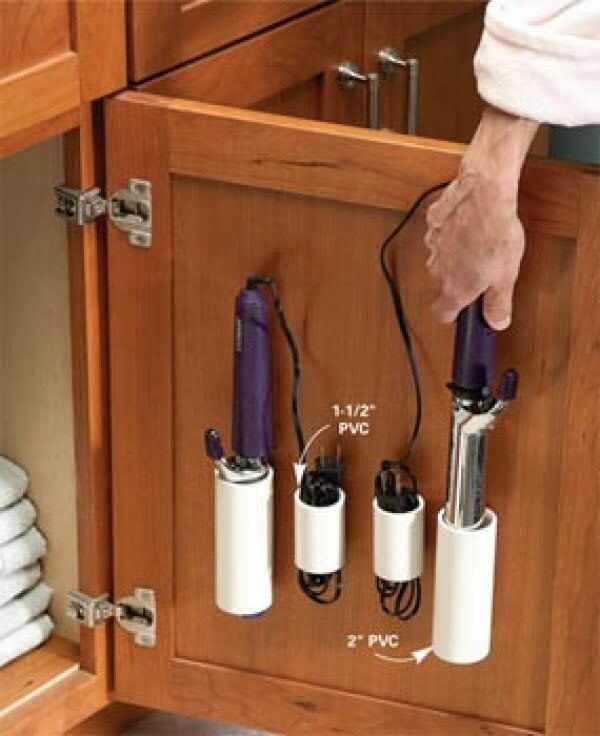 Keep your bathroom items tidy and accessible by attaching simple PVC pipe tubes to the inside of cabinet doors. 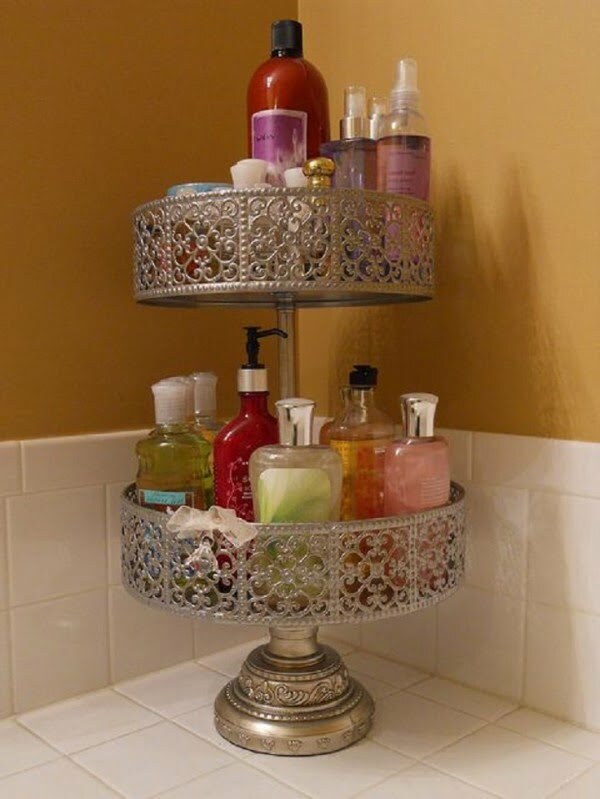 An attractive cake stand can serve as the perfect storage unit for your bathroom items while adding some decor interest at the same time. Small shelves installed in a limited space in a clever way can serve as a brilliant shoe rack. Try this idea if you think you have the perfect space for it at home. 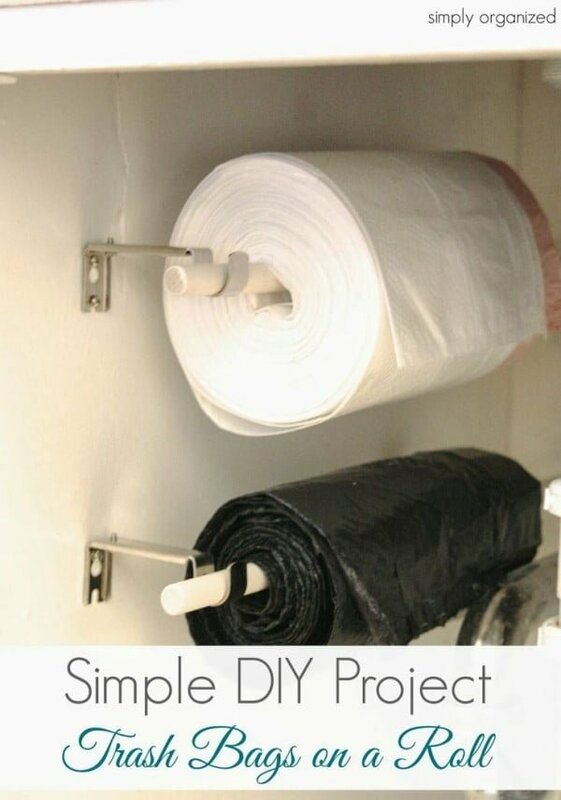 Trash bags can be stored for easy access under the sink if you implement these simple holders. 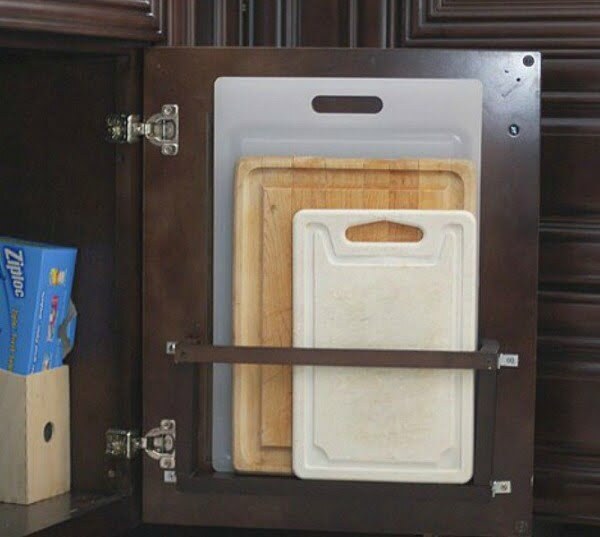 Simple adhesive hooks can be used on the inside of cabinet doors to easily store lids. 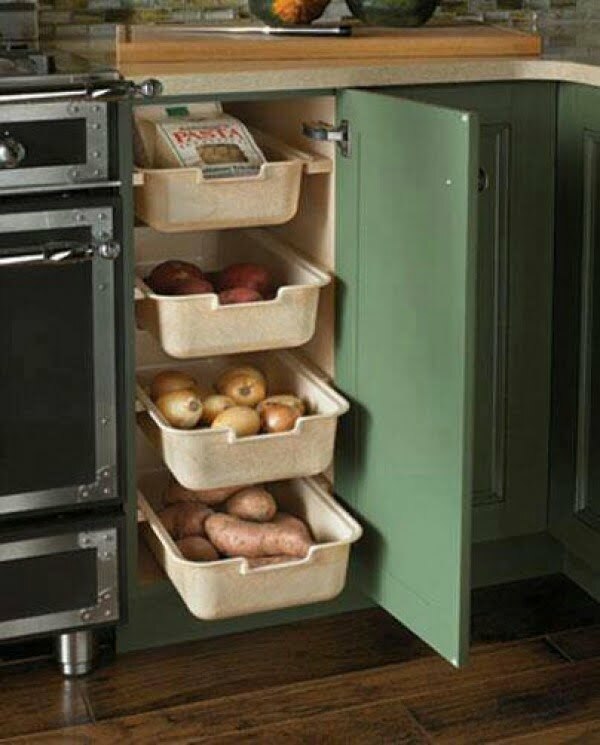 Here’s another way to easily store vegetables in cabinets without making a mess. Build a rack of a few attractive buckets to create a chic storage unit for your bathroom items. Scarves should be kept tidy but its so easy to lose them in the closet. 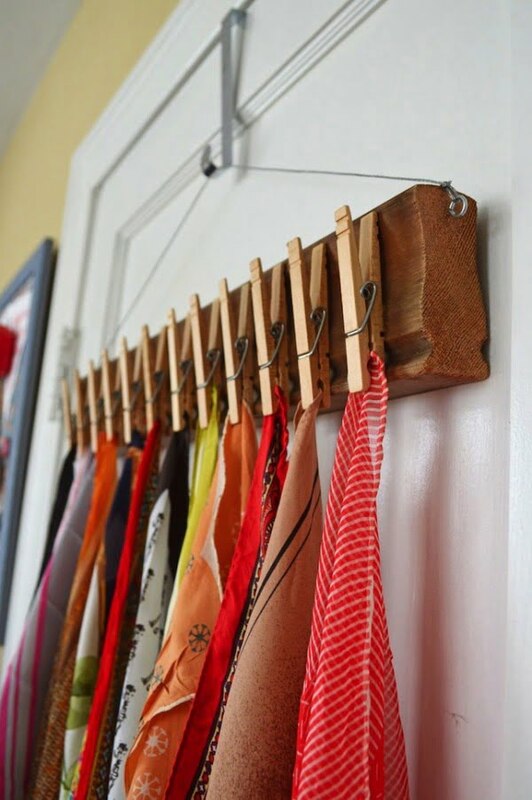 Build a rack of clothespins to conveniently store all of your scarves and other accessories. When you think there’s no more free space left for storage, there’s always some over the doors in your house. Add a shelf there for easy storage. 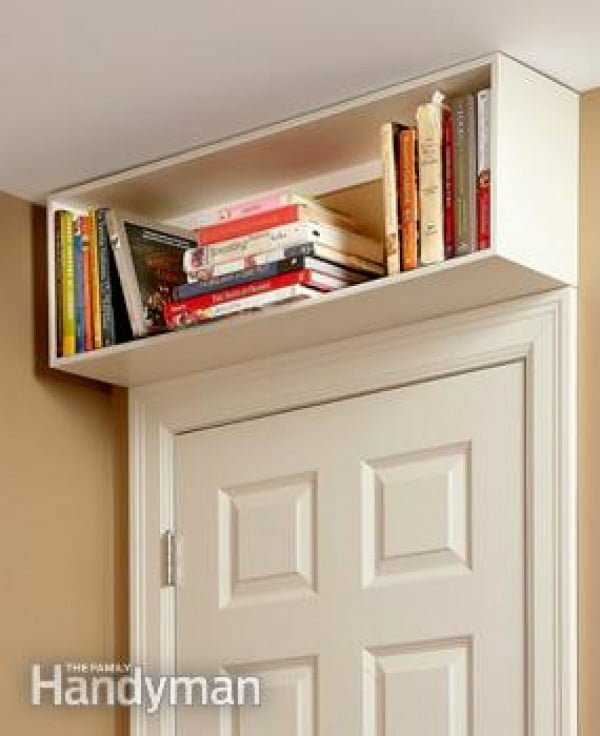 You can even add an entire bookcase over the door and it will be an interesting addition to your home decor. 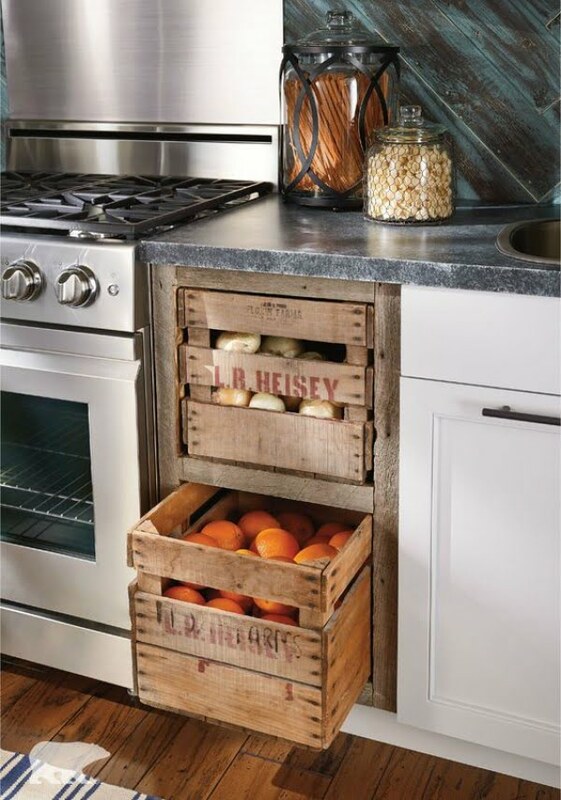 Rustic crates are attractive and you can make use of them for storage in your kitchen cabinets. They work perfectly to keep produce organized. This idea to add a small cabinet over the bathtub is quite chic, especially if you match the style for it. A functional staircase is a pleasant surprise in any home. 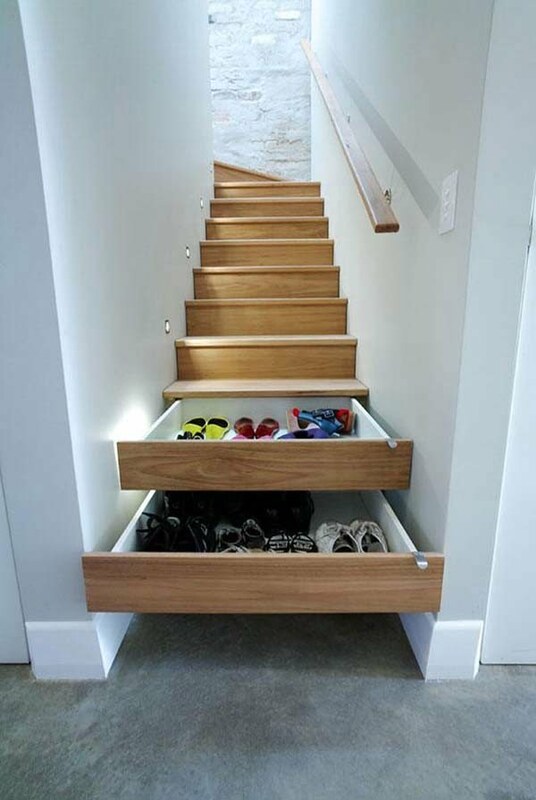 Drawers built into the stairs is a great space to keep shoes and other things. You have a TV and you have to place it somewhere. Whether it’s a stand or its hung on the wall, make sure to use it for storage. Get a stand with cabinets and even if the TV is suspended on the wall, use the space underneath it. This is the perfect space for DVDs, books, or display items. And you can even use a small bookcase as a TV stand for an interesting look. You’re going to have a coffee table or an ottoman in your living room, so get one that has a storage unit built in. That way you can store stuff and hide it out of the view in a very functional way. Here’s a sneaky way for extra storage. Place a bookcase behind a couch, whether it’s in the middle of the room or against the wall, it doesn’t matter. Either way, you’re using the same visual space and make the couch more functional. 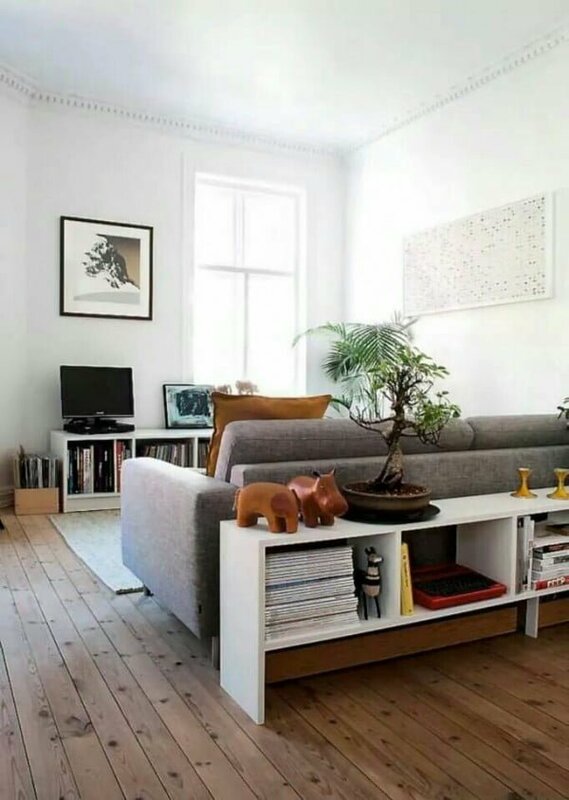 If the couch is against the wall, consider adding wheels to the bookcase so you can draw it out and get even more hidden storage space that way. 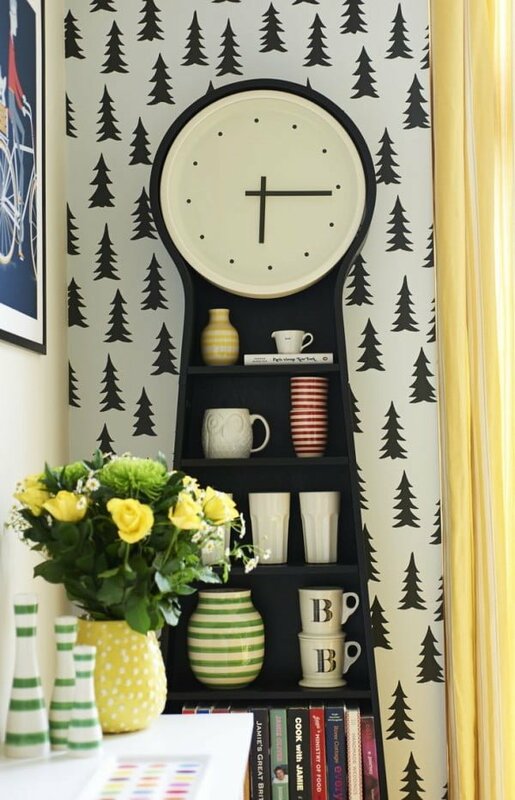 To make your home decor more interesting, get a freestanding wall clock with storage space. You may want to have an accent like a clock as part of your interior design anyway, so might as well make it functional. If you have a small kitchen or a bathroom, don’t be afraid to carry kitchen and bathroom items to store in other rooms. That’s especially true if you have an open plan kitchen or the bathroom is next to a hallway. Use cabinets and bookcases to store items from these rooms thus extending their space. Open shelves can get overwhelmed with stuff and that can make the room look cluttered. To avoid that, use beautiful baskets that will take away that clutter. There’s a lot of free space under your bed, don’t let it just collect dust. Get a bed with storage units and make use of that space for linens, covers, duvets, or clothes and other stuff. Make sure your nightstands have cabinets or shelves for extra storage when decorating small spaces every piece of furniture is important. So make it count.